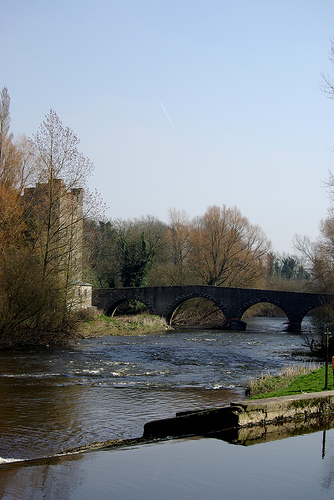 Milford Mills are located at Ballygowan on the banks of the River Barrow about 8km south of Carlow town, Ireland. The Mills, which were established by the Alexander family in 1790, contained flourmills, kilns and malt houses. From the time of establishment he business of the Mills grew rapidly and by 1840, Mr. & Mrs Hall’s “Ireland” described the Milford Mills as ‘one of the most extensive and celebrated in Ireland’. The huge buildings were reported to house two of the largest mill wheels in Ireland. In 1862 disaster struck when the Mills were destroyed by fire. The local Milford Constabulary were the first to notice the fire at around 11.30pm. The alarm was raised and the fire brigade from Carlow was called to the scene. Police from Carlow town and the nearby stations at Leighlinbridge and Bagenalstown also rushed to help. Despite the best efforts of the fire brigade, people who worked at the mills and the police, the mill, machinery and large amounts of corn were destroyed. A local newspaper, The Carlow Sentinel reported ‘a sad scene of havoc and desolation’. Almost thirty years after the fire, Milford Mills was used to generate an electricity supply for Carlow town. The electricity was used for approximately 7.5km of street lighting and the supply of electric lights to 1,500 private users. When the electricity supply was switched on, on June 24th 1891, it made Carlow the first inland town in Ireland to have electric lighting. Today Milford Mills continues to supply electricity to the national grid. The flour mills section of Milford Mills near Carlow town destroyed by fire in the year 1862 On This Day. How did the Millford Mills get their power ?